It seems as though Paris invented nightlife, from cafés to cabarets to nightclub revues. So...do your own research! What better place? The heyday of the great Paris supper club revues was before World War II, before cable TV and surround sound movies. Shows are still staged here, and they are still spectacular, but they are also somewhat self-conscious, and relatively expensive. Still, if you enjoy stage spectacle, you're in the right place to enjoy it. Le Lido, 116 bis Avenue des Champs-Élysées (Métro: George V). Le Folies Bergère, 32 Rue Richer (Métro: Rue Montmartre or Cadet). Le Crazy Horse Paris, 12 Avenue George V (Métro: George V or Alma Marceau). Le Moulin Rouge, Place Blanche, Montmartre (Métro: Blanche). 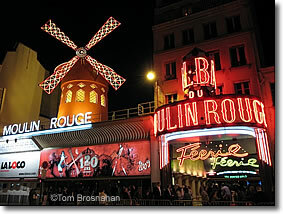 The Bal du Moulin Rouge, Pigalle.